The economics profession is gradually coming to terms with the need to rethink the way that macroeconomic analysis is conducted and progress evaluated. The Global Crisis revealed significant flaws in the way that both monetary policy and prudential regulation were managed (Gerlach et al. 2009, Canuto and Cavallari 2013). The rise of political populism has highlighted the dangers that arise when the welfare gains from technological change and globalisation are not widely shared and social mobility is impaired (Rodrik 2017). Accelerating climate change is the direct consequence of policies that pursue short-term growth goals at the expense of the environment and long-term sustainability. The strong tilt of traditional analysis towards developments in the richest countries neglects what is happening in countries where the bulk of the world’s population live and where dynamic change is often the most prevalent. There are a variety of indices and indicators that have been created to capture the broader array of factors that influence societal health, success, and sustainability. These include the World Bank’s Human Development Index, Yale’s Environmental Performance Index, and the University of Gothenburg’s Varieties of Democracy (V-Dem) indicators. However, these and other indicators are rarely put together in a systematic way. 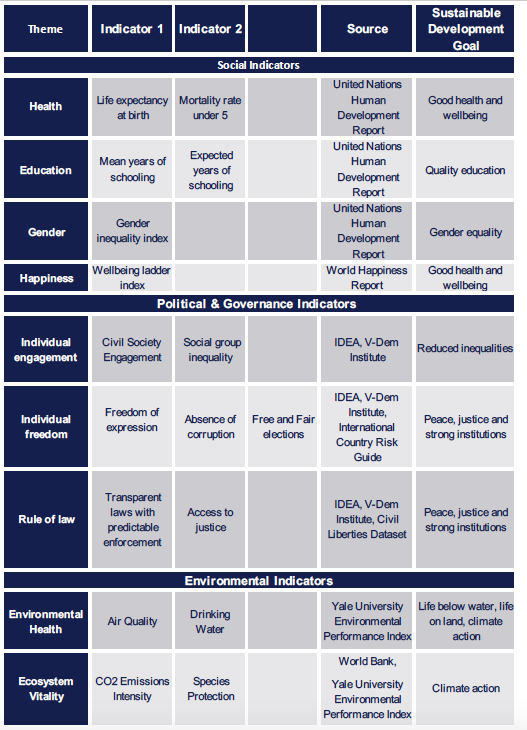 To fill this gap and recognise that the most successful societies blend strong economies with healthy environments, inclusive social policies, representative political institutions, and fair legal frameworks, we have built a new indicator of national progress for 135 countries (Lawson et al. 2018) that combines a measure of economic strength with environmental, social, and governance (ESG) factors aligned to the UN Sustainable Development Goals. 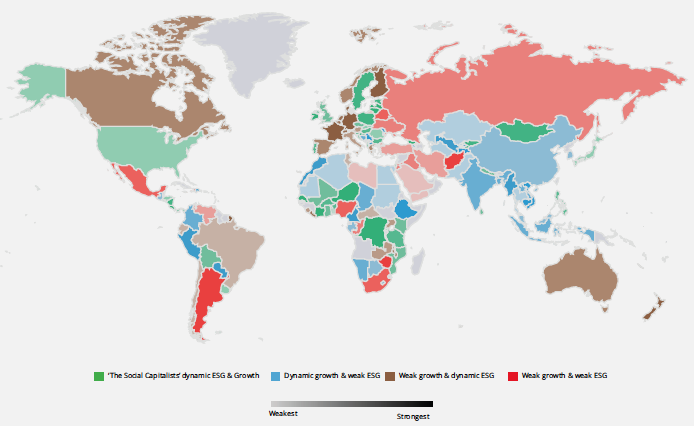 To measure economic dynamism, we calculate the extent to which a country’s per capita GDP in purchasing power parity terms has grown more quickly over the past five years than one would expect based on their level of development and their past performance. Dynamic countries are those that exceeded their benchmarks while also converging on US living standards. To measure ESG dynamism we developed our own proprietary ESG index covering four environmental, six social, and seven political and governance indicators (see Figure 1). 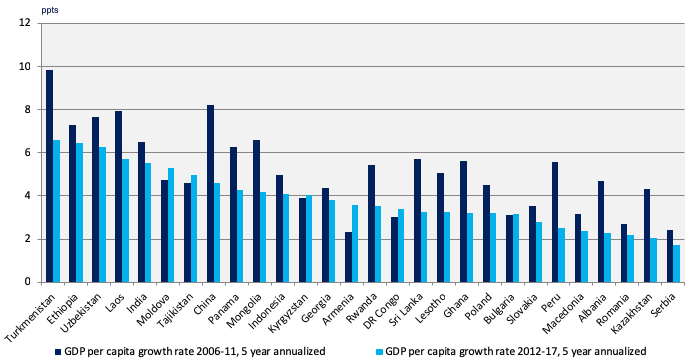 Because ESG indices are highly correlated with countries’ living standards, we then regressed our raw index on the level of per capita GDP. That in turn allows us to identify the extent to which each country has made (and is making) progress on sustainability goals given their level of development. The final stage pulls the analysis from our economic and ESG benchmarking exercises together. Countries that are performing better than both benchmarks are deemed ‘Social Capitalists’. Figure 2 shows how countries are distributed across the four quadrants of ‘Social Capitalism’. Of the 135 countries in our study, 46 are currently ‘Social Capitalists’. Although they can be found across the development spectrum, the majority are either middle income emerging economies or low income economies, particularly in Africa. Source: Aberdeen Standard Investments, UN, Yale EPI, IDEA, V-Dem, ICRG, Happiness Report, Maddison Project, World Bank (as of October 2018). A great deal of media and policy attention over recent years has been focused on the West’s sluggish recovery from the financial crisis. This is attributable to myriad factors including weakened monetary policy transmission at the lower bound for policy rates (Levin 2010), widespread private sector deleveraging (Arslanalp et al. 2015), overly restrictive fiscal policy (Wren-Lewis 2015), slow growth in R&D investment (De Ridder and Teulings 2017), secular stagnation (Summers 2014) and lower potential growth. However, when we shift our attention from the large developed economies that have struggled the most in recent years to the developing world, we find that strong growth in living standards has been the norm, not the exception. Indeed, the vast majority of developing countries converged on US and other developed country living standards over the past decade. This is a distinct improvement since the 1980s and 1990s – and in many cases this has been accompanied by impressive progress on sustainable development objectives. This reveals that the supposed trade-off between strong economies and strong societies is a false one. It also highlights the benefits of globalisation at a time when support is dangerously low. Without globalisation much of the poverty reduction in developing countries over the past 20 years would not have been possible (Lang and Tavares 2018). This is a good news story that deserves to be more celebrated. Moreover, stronger absolute and relative growth is helping to provide the resources to build political coalitions to support the ESG goals that will make future growth more sustainable. That said, there is still work to be done. For developing countries to sustain this strong growth performance over the next decade and beyond, further domestic economic and institutional reforms will be necessary, especially since the tailwind from globalisation is currently fading. Although two of the most prominent developing economies – India and China – do not make the ‘Social Capitalist’ grade, both have been persistently economically dynamic. Moreover, recent developments suggest that their governments are starting to place more weight on broader measures of progress. If China is to become a ‘Social Capitalist’ it will need to improve the transparency and representativeness of its political and governance institutions in particular. In India, the focus should be on environmental indicators and social equality. Conversely, the majority of developed economies – particularly in the euro area – have scored well on sustainability factors but failed to generate robust economic growth. The danger is that this persistently weak economic growth will amplify existing populist pressures and eventually undermine support for broader sustainability goals. If developed countries’ commitment to open economies and societies weakens further, it will inevitably weigh on their own growth prospects. It would also damage the prospects for further catch-up growth in developing countries. At a time of enormous productivity, demographic, social, and environmental challenges, this would prove especially counterproductive. The task then is to identify country-specific political and policy solutions that can reconcile each of these objectives. Exceptions to the pattern of weak economic performance and strong ESG credentials among the developed economies include countries like Portugal, Ireland, and Sweden, which have performed well across both dimensions. Meanwhile, Japan stands out – contrary to general wisdom – as an economy that has been more economically dynamic than most, with the country’s shrinking working age population (Beauchamp 2016) masking relatively healthy productivity performance. Abenomics has not been the failure it is sometime made out to be. Although most countries’ ESG scores have shown a rising trend over time, there is a lot of room for improvement. Most major countries are not doing enough to reduce greenhouse gas emissions and limit the damage from climate change, nor to improve air quality. The Paris Agreement is a starting point for addressing the enormous challenge of preventing further damaging increases in global temperatures, but much more needs to be done, both at the national level and in terms of international coordination. It is encouraging that Finland, France, and the Netherlands have seen improvements in their air quality since 2011 but Norway, Denmark, Switzerland, Australia, Spain, and Portugal have actually worsened during the period. And while income and other inequalities between developed and developing countries have been shrinking, disparities within countries are high and have risen over recent decades (Lang and Tavares 2018). Social group equality and participation in civil society organisations were either the least improved or the worst indicators across our whole sample of major markets. Against a backdrop of populist politics shaped in part by the discontents of globalisation, this degradation of equality and representation is striking and concerning. Addressing these is important for gaining broad-based buy-in for growth enhancing reforms; a challenge that policymakers are struggling to meet. The best way to think about ‘Social Capitalist’ analysis is that it tells us something important about a country’s health and the long-term sustainability of its development model. A country enjoying rapid growth at the expense of environmental, social, or governance outcomes may find it hard to sustain that growth into the future. Our work sheds lights on which countries are making the most progress on joint economic and sustainability criteria. Many of these countries – particularly in Africa and Eastern Europe – fly underneath the radar in traditional macroeconomic analysis. Focusing on growth dynamism alone, the past decade has seen enormous economic progress amongst developing countries, in contrast with the generally weak performance of the developed economies over this period. The latter should not be ignored because of the way they are shaping national politics and the broader geopolitical environment. But the fact that so many developing countries are closing the income gap should be celebrated more. Unsurprisingly, the highest ranked countries in our raw ESG index are in the developed world. However, even these face significant challenges in improving air quality, tackling climate change, and reducing inequality. When we adjust our raw ESG index for countries’ level of development, high-income countries also tend to dominate the top of the rankings, but our analysis shows that a number of predominantly sub-Saharan African countries are doing well compared with their low-income peers. Meanwhile, the worst ESG performers in development-adjusted terms tend to be concentrated in North Africa, the Middle East, and parts of Asia. In the future we intend to extend our work in a number of ways. We will identify best-practice ESG-related policies and institutions that can be feasibly imitated elsewhere, beginning with the environment later this year. We will explore the extent to which our ESG index and its components contain ‘causal’ information about countries’ long-term growth prospects as well as how growth dynamics influence ESG choices. This will include a more thorough investigation of the link between growth dynamics, ESG factors, and asset returns. Arslanalp, S, R De Bock and M Jones (2015), “Trends and prospects for private-sector deleveraging in advanced economies,” VoxEU.org, 4 June. Beauchamp, Z (2016), “Japan’s demographic time bomb, in one chart,” Vox.com, 13 April. Canuto, O and M Cavallari (2013), “Integrating monetary policy and macroprudential regulation,” VoxEU.org, 21 May. De Ridder, M and C Teulings (2017), “Endogenous growth and lack of recovery from the Global Crisis,” 13 July. Gerlach, S, A Giovannini and C Tille (2009), “Are the golden years of central banking over?” VoxEU.org, 17 July. Lang, V and M Mendes Tavares (2018), “How income gains from globalisation are distributed,” VoxEU.org, 27 April. Lawson, J, S Kelly, Y Dunga and N Hardie (2018), Social Capitalism: Taking a wider view of national progress, Aberdeen Standard Investments Research Institute. Levin, A (2010), “Monetary policy at the zero bound,” VoxEU.org, 26 November. PRS Group (2019),“International Country Risk Guide (ICRG)”. Rodrik, Dani (2017), “Economics of the populist backlash,” VoxEU.org, 3 July. Summers, L H (2014), “Reflections on the new ‘Secular Stagnation hypothesis’,” VoxEU.org, 30 October. United Nations Development Programme (2019), “Human Development Reports”. University of Gothenburg (2019), “Varieties of Democracy”. World Bank (2019), World Bank Data. World Happiness Report (2018), 2018 World Happiness Report. Yale University (2019), “Environmental Performance Index”.